It isn’t often that I leave Ocean Beach to try a restaurant in Pacific Beach, but today was an exception. 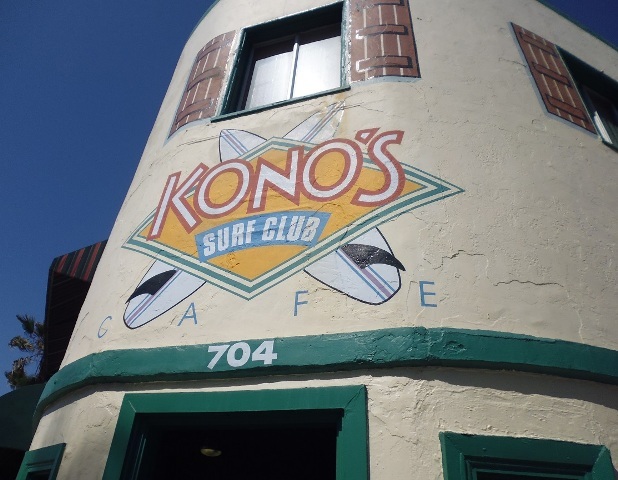 We ended up at Kono’s Surf Club in PB. But before that, the four of us widows had a plan: to “celebrate” the deaths of our husbands, and everyone was anxious to go to the cemetery – Ft. Rosecrans – to see if any progress has been made on its grounds since we all made the trek up there last month. At the same time, Ro had discovered an estate sale being held in La Jolla, so we thought it would be fun to go there after the cemetery. And, said I, “if we are going to be in La Jolla, why not try someplace to eat in the area?” and all agreed. We went to Ft. Rosecrans and Doug Ledbetter, the new Director, told me he would be home most of the day and to stop in so he could answer our questions. He was most gracious; spent 45 minutes answering questions; giving us some information we didn’t have before, and told me that I could expect a monthly update in the next few days or so that I could publish in the OBRag and San Diego Free Press. From there we went to the estate sale and all of us were disappointed in the merchandise that was for sale. The view, however, was magnificent, and we stayed about an hour just looking out the windows. Before we left the house, I had done some minor research on Kono’s and suggested we try having breakfast there. (It was 2:15pm). Ro checked her “Iphone” and found they were open until 4:00pm – so away we went. I was afraid that since it was a Saturday they would be packed, but it turned out we had no trouble getting a table and placed our order with Martin – the most helpful order taker we had met in a long time. 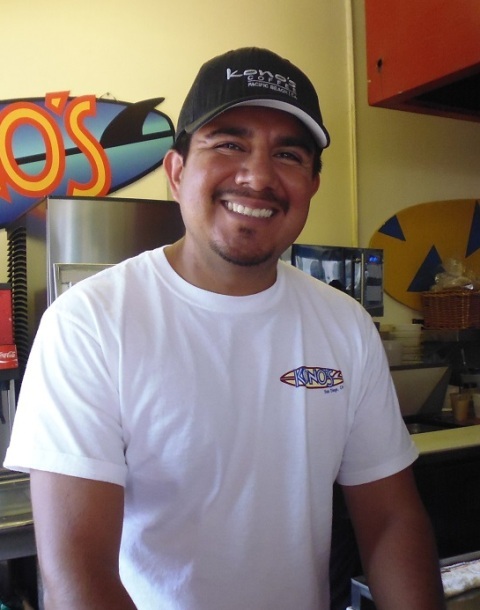 He answered our myriad of questions – what’s in the burrito? ; how many different burrito’s are there? etc. 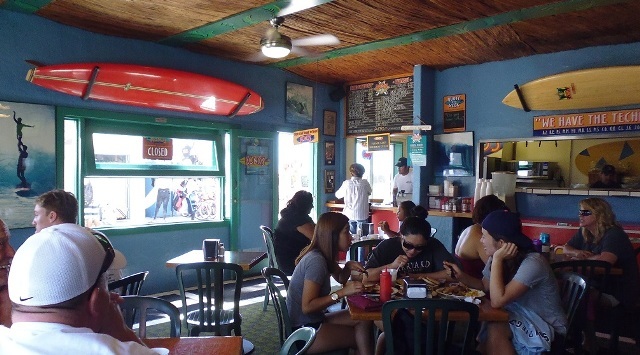 They are only open for breakfast and lunch, but are right on the boardwalk, almost across from the Crystal Pier. We were amazed at the low prices, and later were amazed of the wonderful food. 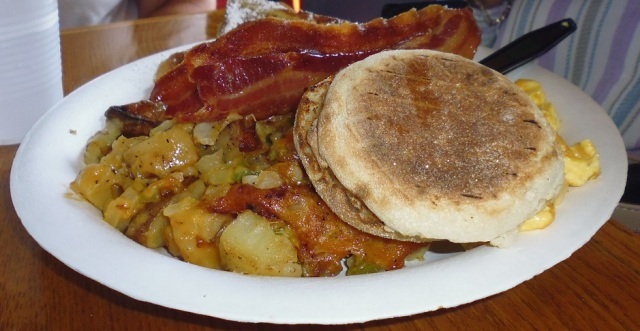 Irene had the “Big Breakfast #2 ($6.95) which consisted of eggs, bacon, English muffins, potatoes and French Toast. “Big” doesn’t even begin to describe it. Ro ordered the “Little Breakfast” ($5.95) with bacon. It consisted of 2 eggs, Kono potatoes and wheat toast. She commented that the eggs were served just the way she ordered them; she ordered crisp bacon, and everything was perfect. Candy and I ordered the Egg Scramble ($6.95) which were scrambled eggs, bacon, onion, green pepper, cheese, English muffin and potatoes. Neither of us could find any fault with the meal. The four of us took our leftovers home, and there is enough left over for another meal. The menu offers 16 breakfasts and 13 lunch items. Fries are $1.75 extra. The beverages were all pretty standard. Without question the service, food, and ambiance was fantastic. The four of us will be back, either together or with others. This originally appeared at OB Rag. High school dropout who decided to show the educational community what learning is all about. If it's the status quo something's wrong with it and I'll scratch the itch! As a former denizen of PB I am very well-acquainted with Kono’s excellent breakfast. Surprised you didn’t mention the breakfast potatoes, which are THE world’s BEST. They have the technology! On par with Pipes’ potatoes in Encinitas? Those are pretty damned tasty! Don’t know Pipes at all. The Kono’s cure for those mornings after is Crystal Pier and the Pacific.